V.com weekend vote: Which is your favorite string? 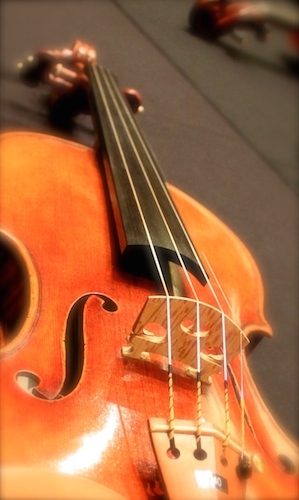 Which is your favorite violin or viola string, and why? Of course we need all our strings, and we appreciate them differently, depending on the music. But writing about Giora Schmidt and his quest for a modern instrument this week, I was struck with one of his preferences: that he wanted a violin with power on the D string, for those special D-string moments, like the beginning of the melody in the first movement of the Tchaikovsky concerto. It made me think, which string do I like best on my own violin, and why? When I pick up another violin, what do I want to hear from each string, and what would be a deal-breaker, if I didn't like it? Some people don't like the brightness of the E string, and yet check out 16:08 in the video above -- what other instrument than the violin can reach those height and still sound gorgeous? Of course, the A string seems to be at the center of our universe, the beloved note that tunes the orchestra. Should it be 440, 442, higher? Do we think much about this string, or is it just a workhorse for us, between the juicy high and low notes? And I've included the C string, as we are all one family here in the string section. Many love those rich deep tones better than anything else. I like my A string because I feel I am getting the optimal combination of power and color. Almost like an E string "with benefits." Partly that's because my technique is not yet good enough to get the best tone on my D and G strings toward the upper part of the fingerboard. I wonder if the preference for the D and G strings increases with professional players who do not have this limitation. As for pitch, for heaven's sake can we please just leave it at 440? And by the way, Laurie, I absolutely LOVE the Weekend Vote. I think that is a terrific feature. I personally favour the G. I love a violin with depth, but I also really miss a fine E string after I play one on a great fiddle. It's really hard to have both on the same. As for tuning, I do prefer tuning to A 442 or even 443. 440 really sounds low to me, especially as you descend to the lower strings and the pitch gets progressively lower with each 5th. It's quite noticeable. Overall, I would say flatness sticks out to the ear more than sharpness, so I think tuning to 442 (or to a D major chord rather than minor on the piano) will give the bottom strings the bump up they need to not sound flat. Right you are Jeremy, all fixed. I like my G on the viola and D on the violin. Perhaps because each exists not at an extreme of the instrument's range, yet towards the deeper, fuller end of each. Especially when a resonant note is played that activates the string below, that really hits the sweet spot for me. The G string is the most fun string of all. Especially unstringing it. The copper-wound Chorda gut G I have on my old violin purrs like a big cat, a wonderful sound. It also chases away the wolves that otherwise live on other non-gut G strings. The way Nemes senior repaired my Stainer model, the G string tone was gorgeous and that was my favourite string (slow movement of Brahms D minor, yummy!). But the repair didn't last more than 20 years (partly our fault - we forgot he told us not to move the soundpost), I had to have extra wood put in, and the distinctive nature of that G string is no longer there. I'm not sure that I have a favourite string now. Although I don't have just one favorite, since I like each string for different reasons, I voted G. Having voted, I can see now that the G has the largest vote share at the moment -- 31%. I've always liked a dark, viola-type sound in the contralto register. One of my fiddles is especially good for this with darker-sounding wound gut or composite core G. I have to watch that I don't overdose on sul G tones -- one-string scales, arpeggios, improv's. Besides playing violin, I also work out a lot, and I begin to feel the demands on the right shoulder if I play too long on the G without a break. But I also seek brilliance in the high tones -- without shrillness or over-loudness. So I'm picky about which E strings I use on my different fiddles. Regarding the A tuning: I can tolerate up to 442 as a listener, but not higher. As a player, I tune to 440 -- unless I'm playing with a piano that's off. Thank goodness for the singers -- notably the late Renata Tebaldi -- who have put their collective foot down on the matter of pitch inflation. I voted for my E. I love the singing descant and the way it soars. For me it's the most exciting string. Love my G too ... the deep, rich baritone. My A is my least favorite. It's always been the most difficult to play well for me. No matter what brand or type of string I use, it always stands out as strident. This is a little like being asked to choose a favorite limb. Also a distinction needs to be drawn between which string on the violin we might like best in general, and which on a particular instrument. In the latter, particular case, it depends on which instrument in my collection. In general, one might say that it is the E which immediately distinguishes itself most from the viola and cello, where we can soar to the heights. But, assuming a violin with a very good G, or a very even violin, I'd pick the G. The G has (ideally, again depending on a particular instrument) a richness, color and depth that makes it most convincing in many cases when played alone for long stretches. Think of Paganini's solos for the G string alone, the Willhelm arrangement of the mvt. from the Bach suite in D for G string alone - and in fact known as the "Air on the G String", the long opening of the Ravel "Tzigane", the wonderful passage in the Sibelius 1st mvt. right after the 2nd cadenza, and the long opening statement of the 2nd mvt.- all on the G. These are not flukes. It's hard to imagine any other single string sustaining interest like the G. Yet, again, I'd hate to choose a favorite limb. To me the 4 strings represent respectively, the 4 voices of a mixed choir: the G - bass; D - tenor; A - alto and E- soprano. Nice to have a whole chorus at our fingertips! Union gig on 1st violin causes me to take a different fiddle than if the gig is for 2nd. I have a SHEN with as lusty a D and G as you could imagine...my choice for 2nd violin gigs...For 1st, there is a beloved shop Viullaume and it's bright Frenchy sound. The bright E string sound is favored. Definitely the G on my violin. I bought my Howard Needham fiddle when it was only three years old but the G did not have the depth I wanted. I played that string probably more than any other for the next few years and my teachers could not believe the sound that I could get out of it. It's now my favorite string to play. Well it depends on the instrument and sometimes the string. With my newest violin, I'm a D kinda girl. So soothing yet deep and strong. A violin teacher once told me that D is the sound most enjoyed by the human ear. Whatever, it's sensational and I play it as an open as much as possible! Another violin I have is an old Maggini copy with a G that rocks, it's simply thunderous. Much too loud for normal playing but wows me every time. I agree with Steven Albert, no matter what string type or violin at hand, the A string always has a strident quality lacking in colour. Hard to get to like it. With the E, it's more the string type than the instrument. I simply can't go past the Peter Infeld platinum. It doesn't work with all and every string combination, but most of the time it really makes my E perfect. As for the pitch, I've sometimes wondered about the newer style of nylon or perlon core strings. We are told on the packaging not to tune above the correct pitch or the core begins to tear, thereby presumably shortening the life of the string. Can anyone expand on this and just what is meant by correct pitch?